At times, finding topics to blog about can be tough~ So, I decided to focus on ‘what’s the most difficult thing for me‘ during the building process. And, without a doubt it’s paint selections! Yes, I’ve built many homes over the past 10 years, but this area always keeps me guessing. One of the issues is the fact that there are SO MANY colors to choose from! I mean, you find a color and think, “I love it”…then you compare the tiny swatch of color to another possible contender… and now it looks purple?? Ugghhhh…the process can be so frustrating! 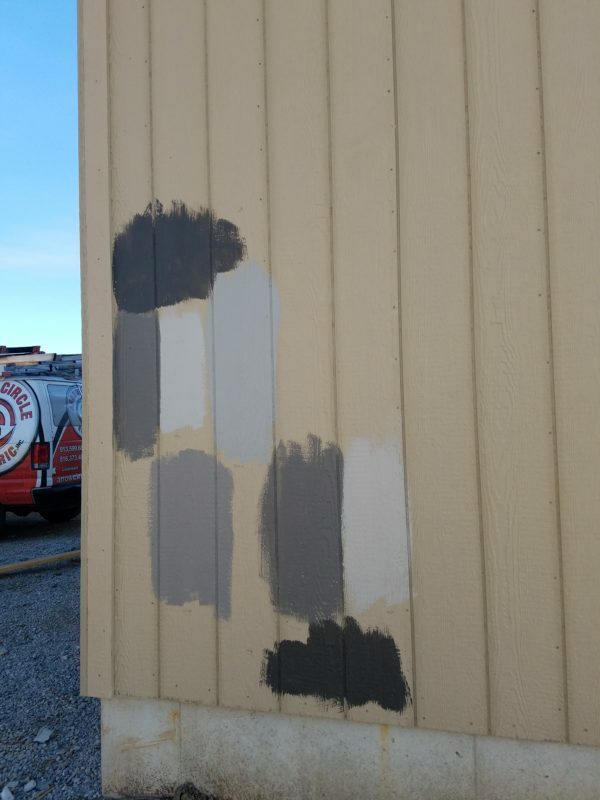 Ok, let’s start with the Gray family of colors. There are literally 50 plus shades of gray to choose from! For some, this may have you screaming “YAY, so many options!”. But for me, it’s more like “NOOO, so many options!”. With this new trend in color, I found myself a little worried ~ what was going to “appeal to the masses”? 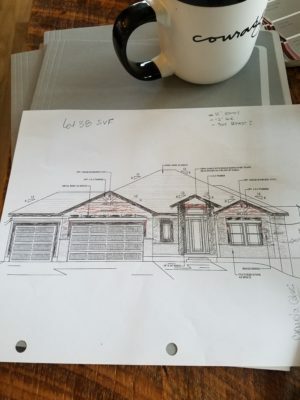 When designing a spec home for Stewart Builders…that is the #1 question! Unfortunately, I learned the hard way on a few. Let me help you save some of your sanity AND money! The solution for me? 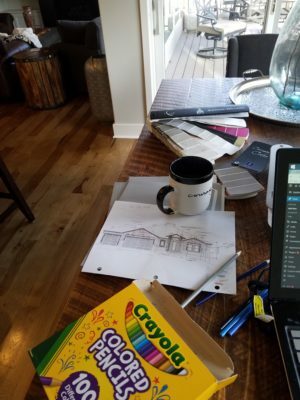 I start with printing the front elevation, get my nifty colored pencils out, a cup of coffee (of course) and start to color! Getting creative always means getting messy, here is one of Stewart Builders latest projects~ The Mackenzie II. This is our 4 bedroom, 3 1/2 bath reverse. I’m going for more of a “Lodge” look. Removing the starburst cedar beams, and adding rough cut cedar across the front/peaks…going back to stucco for the remaining areas, as this should be a nice “clean” complement to the rough cedar. Also adding bronze metal roof accents over the garage and bedroom windows. Stone selection is still to be determined! Once I feel confident in my theme for the house (this one I lovingly named the “Modern Lodge”), I head to my supply of paint samples in the garage, grab about 6 or 7 brushes and head over to the house! Decided on Gauntlet Gray for the body, and probably Urban Bronze for trim/doors, etc. These are all Sherwin Williams colors! I always encourage clients to do the same for the interior colors as well. Colors can play tricks on our eyes, and like to take on a different look when the sun hits them at different angles and times of the day…especially Gray tones! Take the time to research what the “most popular” colors are, print your elevation, grab your colored pencils & head to your local paint store! Spend the $5 or $6 per sample…It sure beats paying to have the entire house (exterior &/or interior) repainted! CHEERS to messy, creative desks & feeling confident in your color selections! Contact us to get started building your dream home & stay up to date on all our latest projects via the Stewart Builders Facebook page!